The HumPRO Series is a frequency hopping spread spectrum (FHSS) transceiver designed for the reliable transfer of digital data. It has a very fast lock time so that it can quickly wake up, send data and go back to sleep, saving power consumption in battery-powered applications that have strict power budgets. The HumPROTM Series module has several features that make the data transfer reliable. A Carrier Sense Multiple Access (CSMA) routine ensures that the channel is clear before the module begins transmitting data. Automatic acknowledgements ensure that the remote side got valid data. Multiple hopping patterns enable multiple systems to operate in proximity without interference. 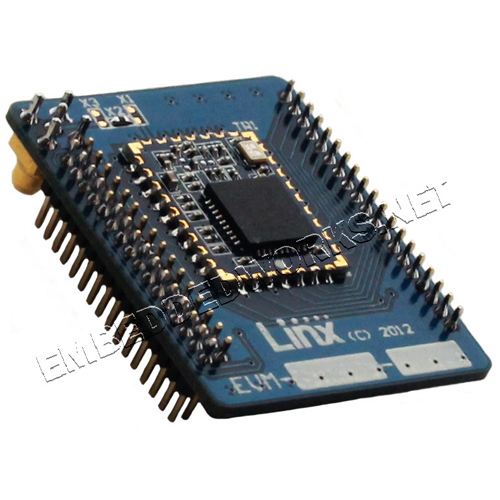 A standard UART interface is used for module configuration and data transfer. All HumPROTM Series modules have a unique 32-bit serial number that can be used as an address. Source and destination addressing support point-to-point and broadcast links. Address masking by the receiving module allows for creating subnets. More advanced networks can also be implemented. The evaluation module contains the surface mount HumPROTM Series transceiver module and an MMCX connector on a single board with through-hole headers. This small board simplifies prototyping with the HumPROTM Series module.